Hola! Me llamo es Lucaya! Even though I was born in Panama, Iâ€™m quite the world traveler and my name is actually Bahamian. It was given to me by my amazing sponsors at Atlantis Paradise Island. 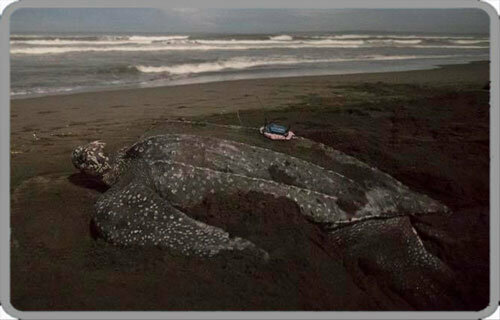 Theyâ€™ve been supporting my other leatherback friends from this very beach for eightyears! I was so excited when I heard it was finally my turn to represent Team Atlantis in this yearâ€™s Tour de Turtles race. I already have more than 25 years of experience migrating under my flippers, so they knew I was the best choice to join them in raising awareness about commercial trawl fisheries. Throughout my years of traveling the globe, I have seen a lot of amazing things, and some not so amazing thingsâ€¦ commercial trawl fisheries being one of those. Commercial trawl fisheries are big boats that drag giant nets behind them, catching all kinds of creatures. Iâ€™ve been lucky that I havenâ€™t gotten stuck in one yet, but it would be very easy for me to get trapped in the net! To make sure other leatherbacks like me donâ€™t get stuck in these nets, make sure youâ€™re eating sustainably sourced fish and supporting companies and countries that use Turtle Excluder Devices on trawl boats. I plan on exploring some new territory this year, so flippers crossed I donâ€™t run into any trawl fisheries during my travels! I was named by my Sponsor, Atlantis Paradise Island. Check out my marathon migration map, where you can follow along as I swim to raise awarness about the threat of Commercial Trawl Fisheries to sea turtles. Please help me raise awareness about my cause by supporting me!